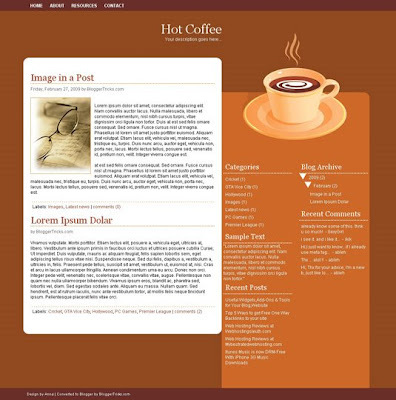 Another 3 Column Blogger Template "Hot Coffee"
Hello guys.. I'm back again! Sorry for not updating the blog frequently as I'm busy preparing for the exams.. Anyways.. here is my latest Wordpress to Blogger conversion.. "Hot Coffee". The template is 3 columns with two sidebars on the right side. The template suits well for blogs related to foods,drinks,cooking,etc..
and upload the downloaded xml file using the Upload button and Save the Changes. M no blogger but still this is COOL! Your blog was just featured on Look At The Details Congrats!! Thanks mate for the excellent review! hi care to xlink? my new site is at http://starcrave.com i've been following your blog since several months and i'm happy for the info's that i get here. it will be helpful for many of us.. Your templates are awesome! Do you think you could make one with a cigar theme? I downloaded your template and everything works great except for the top navigation links. I typed in my link but when I click on any of the other navigation links it just stays on the home page. How do I fix it? Maybe, you did something wrong editing the template.. Can I see your blog? This template make me thirsty ! And if you go there you can see there is a slight problem with the margin spacing of paragraphs. All paragraphs after the first one lose their margin/padding? Same problem in both my test posts. Any idea what's causing this? Hello, I've already uploaded the template and it's great, but how could I justify the text? When I write the content on it, it seems not aligned. You can download a new copy and test it now..
but how can i remove the coffee cup pic and replace it with another one?? Hey do you ever answer your questions and comments.. are u for real..